EU Casino brings a colorful website and a European spirit of service to the table as one of the more forward-thinking casinos on the Web. Operated by SkillOnNet Limited, it is licensed and regulated by the Government of Malta. *Use the code to redeem the bonus. If a code is not available, the bonus is credited automatically. 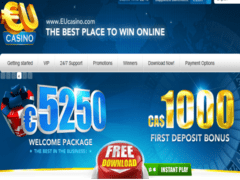 The EU online casino bonus program is highlighted by the €5250 Welcome Package, which they are touting as "The Best in the Business." Well, it is pretty darn good. The first deposit bonus is 100% up to €1000, and then the "welcome" continues through the next four deposits, taking you to €500, €750 and €1500 on each of the final two. On the initial deposit, you will use bonus code EU1000. Then for the subsequent deposits you'll use EU Casino bonus codes of EU500, EU750, EU1500 and 2EU1500. Among the other bonuses offered is a VIP Deposit Bonus up to €2500, with a €500 minimum required. For this one, you will use the bonus code of VIP2500. EU Casino has an interesting software provider - SkillOnNet itself, meaning the games are essentially designed in-house, and they are trumpeting the "best slots on the web." This is a casino that can be downloaded in fifteen different languages. 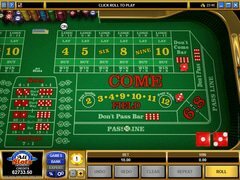 You can preview games like blackjack, including a progressive version, Casino Hold'em, Let It Ride, Pai Gow Poker, Caribbean Poker and many more. European, American and French roulette are offered, as are slots of every kind. There are payment options galore, and they include Visa and MasterCard, as well as a slew of alternatives, among them EntroPay, NETeller, PaySafeCard, UKash, ClickAndBuy, MoneyBookers, WebMoney, Click2Pay, and a dozen regional choices. The casino accepts Australian Dollars, Canadian Dollars, Euros, Krone, Kroner, Kronor, Russian Rubles, U.K. Pounds, and U.S. Dollars. The EU Casino bonus is so expansive that it really deserves your respect and attention, and it is a very good reason to get on board. They have 24/7 support at this casino, and it is first-rate. They can reached through email, of course, as well as by phone or fax. And if that's not good enough, there are live chat operators on call for you. Don't forget those EU Casino bonus codes, or you won't be able to claim your bonuses! This casino accepts players from Canada.